In the previous two posts on this topic, I explained some of the basic pattern matching facilities of Optima library. There are many more advanced features in the library and I will try to discuss them in future posts. 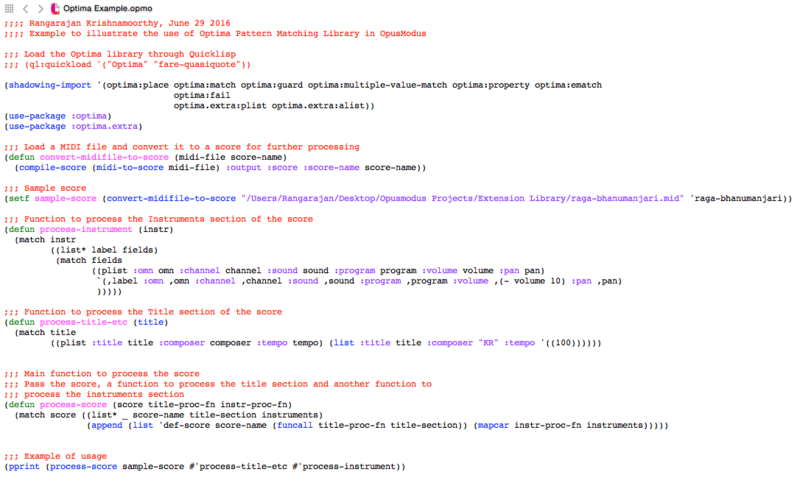 In today’s post, I will outline a straightforward application of the library for processing scores in Opusmodus. In the post, I showed how we can build a simple framework in Opusmodus to read and transform MIDI files. Let us look at the same problem, but this time using Optima’s pattern matching capabilities. The <title-section> and <instrument section> are examples of property lists in Optima, so we can use the matching mechanisms available in that context. For convenience, I have defined a function called process-score that takes a score object as well as two handler functions as arguments and works on the score. Take a look at the two handler functions to see how Optima’s match function is used to de-structure the respective elements for further processing. In the handler for instrument section, for example, you can see how I modify the :volume parameter. Optima opens up many interesting possibilities. Try to experiment. You can download the code here. The example MIDI file is available here.